Current maps do not include old Route 66. The last stretch of the road disappeared from “official” maps in 1985. A famous national museum, nowhere near Route 66, has an exhibit that includes an actual piece of Route 66 pavement. Entitled “America On the Move,” the piece of the Mother Road is at the Smithsonian’s National Museum in Washington D.C. According to most sources Route 66 is 2448 miles long (about 4000 km). However, this is a rough approximation as the road has had many different alignments through the years. Route 66 was commissioned on November 11 1926, picking up as many as possible bits and pieces of existing road. Route 66 crosses 8 states and 3 time zones. The states that the Mother Road runs through are: Illinois, Missouri, Kansas, Oklahoma, Texas, New Mexico, Arizona, and California. In 1926 only 800 miles of Route 66 were paved. Only in 1937 did Route 66 get paved end-to-end. 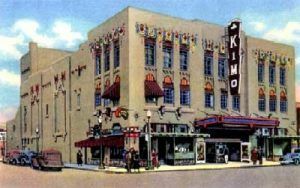 Because of a change in alignment of Route 66 in 1937, there is an intersection where Route 66 crosses itself at Central Avenue and 4thStreet in downtown Albuquerque, New Mexico. Here, you can stand on the corner of Route 66 and Route 66. 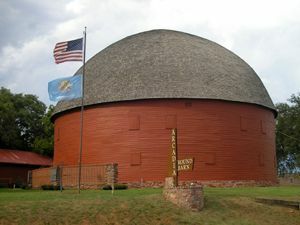 The Round Barn in Arcadia, Oklahoma is one of the most photographed sites on the Mother Road, Kathy Weiser-Alexander, June, 2010. Click for prints & products. The old round barn in Arcadia, Oklahoma is the most famous and most often photographed barn on Route 66. The numerical designation 66 was official assigned to the Chicago-to-Los Angeles route in the summer of 1926. Route 66 starts in Chicago, Illinois and ends in Santa Monica, California. The Corvette has become a Route 66 icon. 91% of the original Route 66 is still in use in Texas. On the corner of Route 66 and First Street in Tucumcari, New Mexico is a Texaco Station that is the only service station to have operated continuously through the Route 66 era to the present. Kansas has the shortest section of the Mother Road with only 13 miles. However, three historic Route 66 towns are located on this short segment including Baxter Springs, Galenaand Riverton. As a publicity stunt in 1928, promoters of Route 66 held a coast to coast foot race that included all 2448 miles of the Mother Road and then some. The race kept right on going far beyond Chicago all the way to New York City. In 1985 Route 66 was officially decommissioned as a federal highway. However, daily use of the road had been gradually replaced in earlier years by the Interstates. The road was decommissioned due to public demand for better transportation as the old road deteriorated after World War II. Route 66 is also know as “Mother Road”, “The Main Street of America” and “The Will Rogers Highway”. 85% of the road is still drivable. Get your kicks on Route 66. Bobby Troup wrote the song, Get Your Kicks on Route 66 in 1946. It has been performed and remixed by several musicians, including Nat King Cole, who first recorded it in 1946 scoring a major hit, the Rolling Stones, and Depeche Mode. During all of its life, Route 66 continued to evolve, leaving many abandoned stretches of concrete, still waiting to be found by the more adventurous traveler. Cyrus Stevens Avery from Tulsa, Oklahoma can be called the father of Route 66. Mr. Avery lived in Tulsa. Conveniently, the new highway ran right past his own filling station and restaurant. Elvis Presley used to like staying at the Best Western Trade Winds Motel in Clinton, Oklahoma. Lou Mitchell’s Café has been providing breakfast for those beginning the long journey on Route 66 since the beginning. Opened in 1923 at 565 W. Jackson, breakfast is still served all day at Lou Mitchell’s in Chicago. Most of the road was replaced by five interstate highways, including I-55, I-44, I-40, I-15 and I-10, but still a surprisingly high amount of old road is waiting to be found by the more adventurous traveler. When is a corn dog not a corn dog? When you’re at the Cozy Dog Drive along Route 66 in Springfield, Illinois. This first fast food of the road was introduced by Ed Waldmire at the 1946 Illinois State Fair. In 1950, he opened the Cozy Dog Drive Inn. This Mother Road icon still stands today at 2935 So. Sixth Street in Spingfield, Illinois, but when go try their “Cozy Dog,” don’t call it a corn dog, or you might be met with little more than a steely eyed stare. You cannot count on the road to be marked with road signs. Though some states and organizations have posted signs, these often disappear with souvenir hunters. Others are simply never posted.Driving the route from west to east is historically wrong, and a lot harder, as all available documentation goes the “right” way. John Steinbeck in his novel, Grapes of Wrath, published in 1939, was the first to refer to Route 66 as the “Mother Road.” Old Route 66 originally began in Chicago at Michigan Avenue and Jackson Boulevard. After the 1933 World’s Fair, the terminus of the road was moved to Lake Shore Drive at the entrance to Grant Park. George Maharis and Martin Milner were the stars of the CBS television series Route 66 which debuted on October 7, 1960. In the show, the stars drove brand new baby-blue Corvettes, though the audience wouldn’t know that because the show was in black and white. The show continued for 116 episodes, finally ending on March 13, 1964. Ironically, the show was filmed on locations all around the USA, but rarely near the real Route 66. Cyrus Avery, the father of Route 66, was the first to refer to Route 66 as “The Main Street of America” in 1927. The last original Route 66 road sign was taken down in Chicago on January 17, 1977. 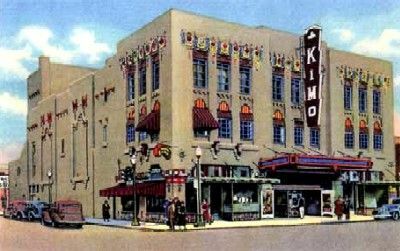 The famous KiMo Theater along the Mother Road in Albuquerque, New Mexico is said to be haunted by the ghost of a six year old boy by the name of Bobby Darnall who was killed at the theater in 1951 from a boiler explosion. According to legend the impish spirit causes the performers problems by tripping them and creating a ruckus during performances. To appease the spirit, the cast leaves doughnuts backstage, which are gone the next morning. The oldest hotel on Route 66 is the Eagle Hotel in Wilmington, Illinois. Though sitting empty today, the 1836 hotel that once serviced stagecoach travelers, has plans of restoration. The first McDonald’s restaurant was located in San Bernardino, California 1945 on the Mother Road. The site is currently home to the McDonald’s Route 66 Museum. Adrian, Texas is said to be the “geo-mathematical” center of Route 66. However, many argue that this claim is actually in Vega, Texas. They’re probably both right depending upon which alignment a traveler might have taken. 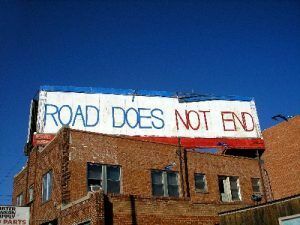 Route 66 does not end along 6th Street in Amarillo, Texas, Kathy Weiser, November, 2005. (The sign is no longer there) Click for prints and products. Oklahoma has more miles of the original Route 66 than any other state. You can own or adopt a stretch of old Route 66. Arizona has the longest stretch of the historic highway still in use today. Quapaw, Oklahoma , the first town on the Mother Road in Oklahoma, is famous for “spooklights”, bouncing bright balls of white fire that have been reported as far back as the 1700s. The Chain of Rocks Bridge in St. Louis was used in the filming of the 1981 movie “Escape From New York.” The bridge was repaved for John Carpenter’s film and appears at the end of the movie when Kurt Russell rescues Donald Pleasance from certain doom. Though closed to vehicle traffic today, the Chain of Rocks Bridge is remains open as the world’s longest pedestrian and bicycle bridge. Tucumcari’s Tee Pee Curios is the last curio store on Route 66 between Albuquerque and Amarillo. Compiled by Kathy Weiser/Legends of America, updated August, 2016. 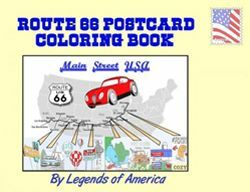 Route 66 Postcard Color Book, available at Legends General Store. I also have a real problem when I hear that St louis is the largest city on route66 between Chicago and los Angeles?Please tell me this is a mistake? I believe the reference is to “metro” population, which is 2.8 million. Of course we are also talking about “between” Chicago and Los Angeles. You say in Albuquerque,you can stand on the corner of route66 and route66?Can you also stand on the corner of route66 and route66 in St louis?Say,maybe at the intersection of Manchester rd and Kirkwood rd?